This page contains a detailed walkthrough of Chapter 4 – Living Legend in Final Fantasy XV, including quests, objectives, items, enemies and bosses encountered in the game. Noctis’ party agree to go with Ardyn Izunia to the Disc of Cauthess, the lair of Titan, despite their suspicions on the figure who claims to be “a man of no consequence”. They head out in a convoy of two cars. 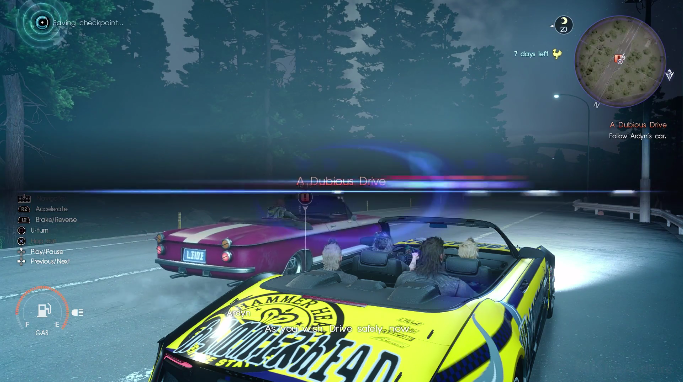 Riding in his car, Ardyn tells the party to follow him on the road. You are not allowed to overtake, lag too far behind or tailgate him, otherwise the quest will fail. 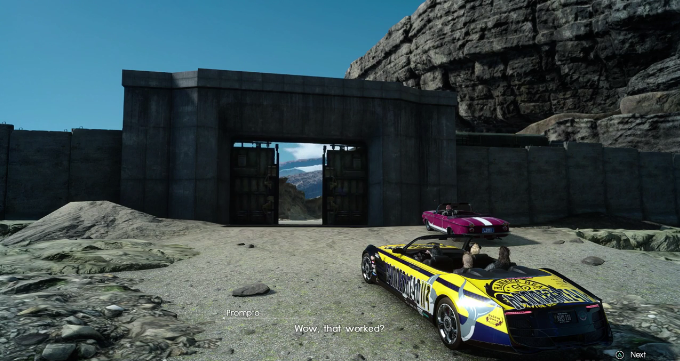 After driving a good distance, Ardyn will pull over at a stop on the road — Coernix Station. He will then suggest that the party spend the night before heading out again in the morning. Agree and your EXP will be tallied. 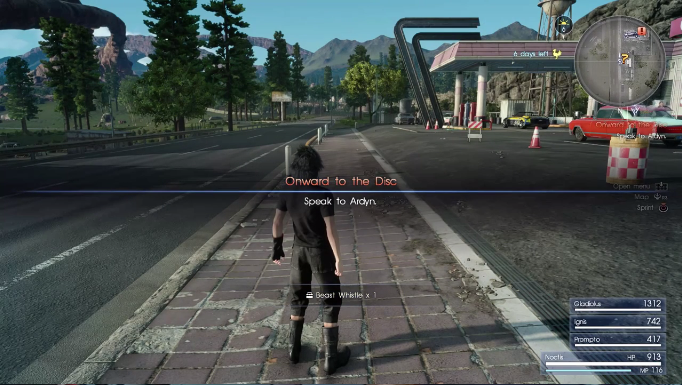 The party decides to set up camp, but Ardyn suggests that they stay in the caravan up ahead and offers to pay the bill. After waking up the next day, you will obtain the Beast Whistle, which summons enemies when you use it. Then, look for and talk to Ardyn. You can also take the time to explore the area. There will be an equipment stall and a convenience store to stock up on healing items. While looking for him, you will come across a radio report about Lunafreya and a cutscene will ensue. 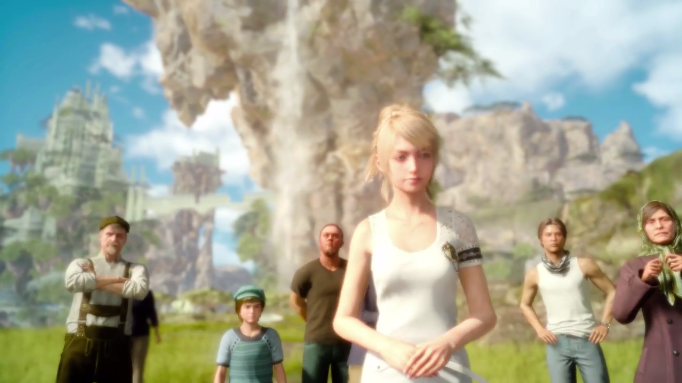 The scene shows Lunafreya attending to her duties as an Oracle to heal people across Eos. 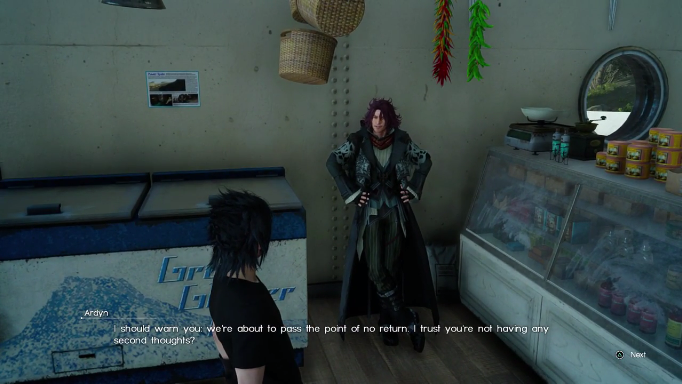 After the cutscene, head to the convenience store where Ardyn is. He’ll ask you if you’re ready to go to the Disc. Answer yes to drive to the next area. 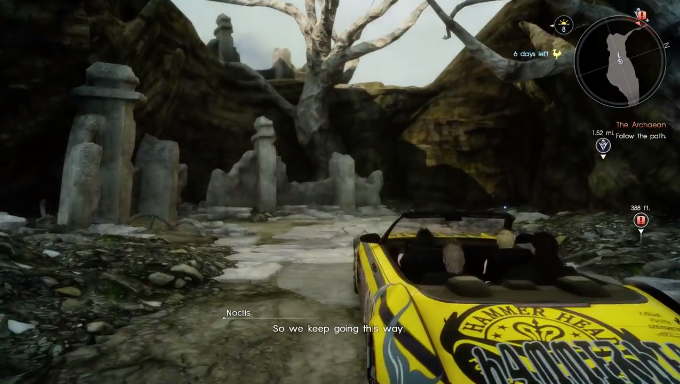 You will then need to follow Ardyn in his car again so be sure not to lose sight of him. You will then arrive at a sealed location which Ardyn will open. 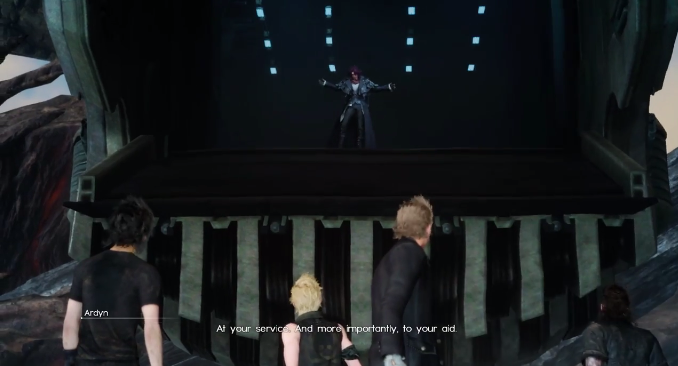 After opening the gate, Ardyn will bid you farewell. Enter the area and drive along the path until you reach a dead end. You will then need to set out on foot and enter the ruins. Pick up 1x Hi Elixir at the entrance, then follow the quest marker. The end of the path will lead to a the Tomb of the Mystic. Approach the tomb to obtain the the Blade of the Mystic. 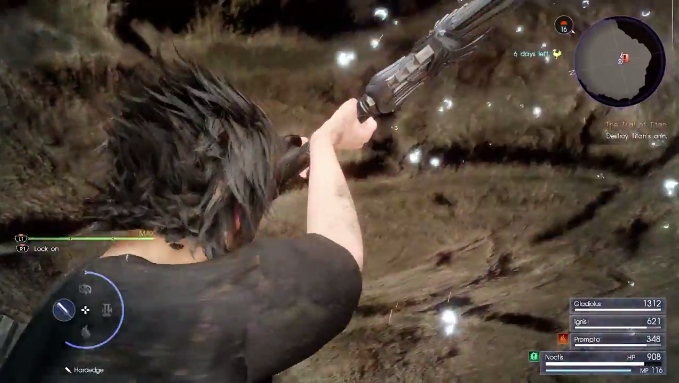 After obtaining the Royal Arm, the area will collapse and Noctis will fall below. Luckily, Gladiolus is just in time to grab him. Mash the 0 button to pull yourself up. It is then revealed that it was Titan, buried under the area you were in, who caused the floor to collapse. Afterwards, follow the quest marker. Along the path to your right is an elemental deposit so be sure to absorb it. The area has flames spurting from the ground which will gradually deplete your HP. You will soon encounter Dynoaevis on your path. Since they generally stay above ground, it is best to use warp-strikes first. When they are grounded, you can finish them off as they are pretty helpless now. A path to the right of the area will lead to three elemental deposits that you can absorb. Afterwards, continue along the path straight ahead from where you encountered the Dynoaevis. Along this path, there will be another elemental deposit to you right. You will soon reach a dead end by the edge of the cliff. Gladiolus will suggest that you try the dangerous path to the right. 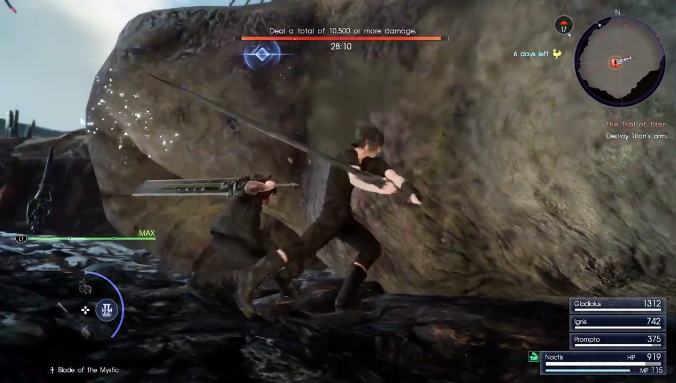 While crossing the ledge, Noctis’ head will start to hurt again. 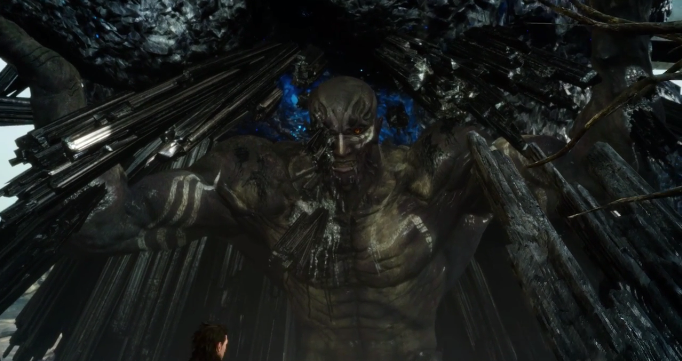 As he and Gladiolus desperately try to make it across, Titan will greet them. Continue on across the ledge. Once on the stable path again, pick up 1x High Phoenix, 1x Megalixir and absorb the elemental deposits scattered in the area. You’ll then arrive at an area where you need to slide below the opening. A cutscene between Noctis and Gladiolus will ensue. 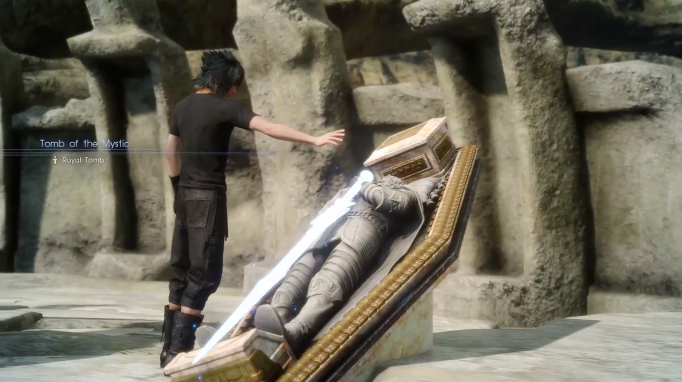 Afterwards, Noctis will be riled up and his strength will increase by 50 %. Continuing along the path, Ignis will call Noctis on the phone while Imperial Dreadnoughts fly overhead in the area. Move along and absorb the elemental deposit. You’ll also pick up 1x Mega Potion. You will soon encounter Magitek Axemen. 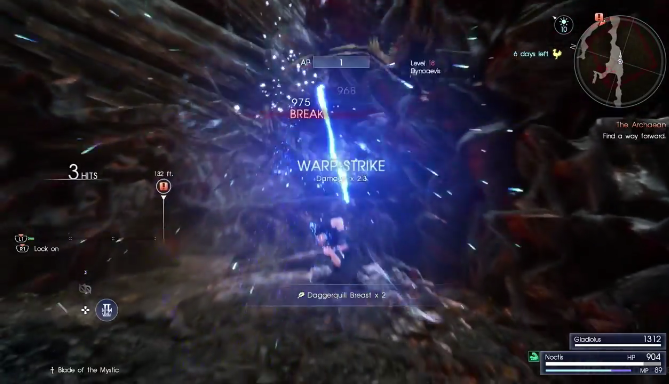 Mix up your attacks with warp strikes and using a greatsword when the enemies bunch up. You will soon come face to face with Titan. He will first try to stomp on you, though he moves very slowly. Watch out for the chance to guard and then parry. 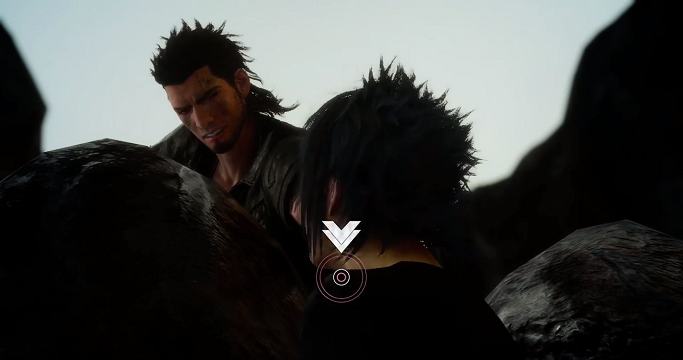 After successfully guarding two of his attacks, Gladiolus will tell you that you should run. Get away and hurry up the path leaving the area. Be sure to keep your camera view on Titan and dodge as he will continue to pummel you as you escape. 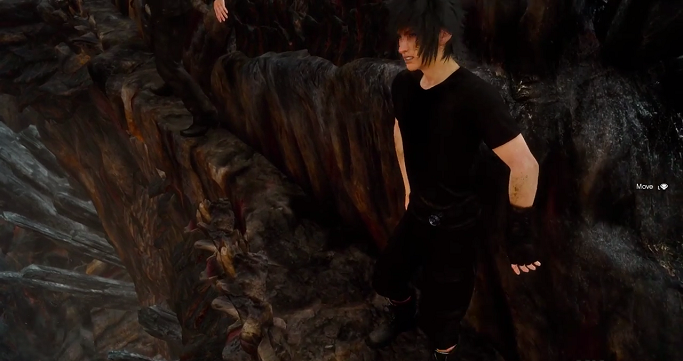 After getting up the path, Gladioulus will give you a boost to climb up the ledge. As you continue your escape, Titan will catch up on you, causing you to fall to the area below. You will need to guard and parry his attacks again. After succeeding two times, you will be able to counter his third attack. From here on, Titan will have vulnerable points that you can attack after successfully parrying him. Titan will also occasionally do an arm swipe move on the entire area so be sure to dodge it. After a while, Ignis, Prompto and Gladiolus will aid you in the fight. 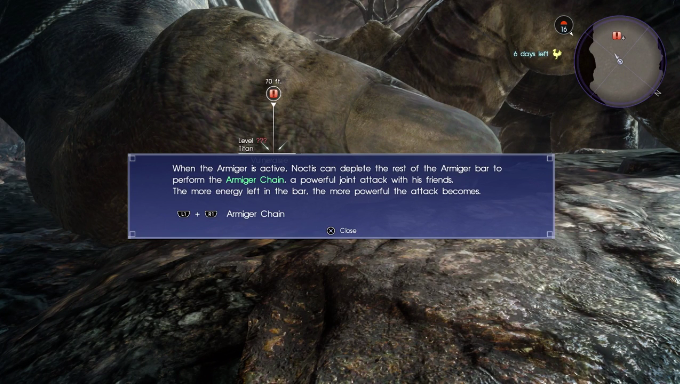 Continue you to parry and doge his attacks until you are able to perform the Armiger Chain. Ignis and Prompot will then come up with a strategy to use Blizzara, but you need to deal 10,500 damage to Titan within the allotted time. After you deal enough damage, the party will all cast Blizzara on Titan, freezing his right arm. You will then have to deal the finishing blow to cut off his right arm. A cutscene showing Ardyn revealed as the chancellor of the Empire of Niflheim will be revealed. He will offer a ride to escape the Disc of Cauthess, which the party reluctantly agrees. 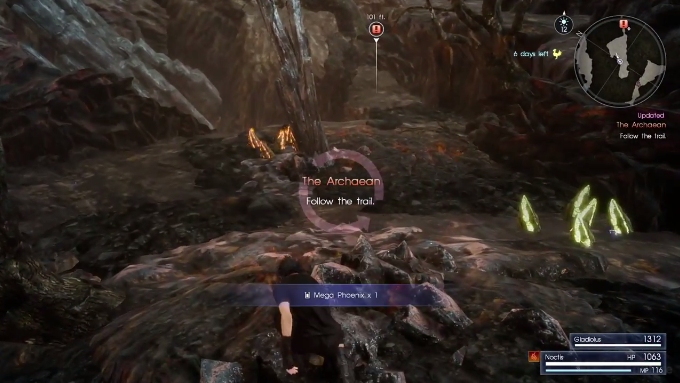 At the end of the quest, you will receive 1x Mark of the Archaean. This concludes the complete walkthrough for Chapter 4 – Living Legend.